Removes metals for up to 6 months. Doesn't add phosphates to the water. Works with all mineral-based water purification systems. Works in all hot tubs and spas. Works of a large pH range. Works with all metal-based algaecides. - Remove CuLator SpaPak cloth bag from the sealed plastic pouch. - Run filter or circulation pump. Metals are eliminated from the water as it passes over the SpaPak. - Discard used SpaPak after 4 months. 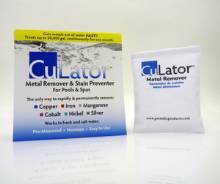 - To keep pool water metal free, retreat with a fresh CuLator SpaPak every 4 months.